I should begin this article[i] with the disclaimer that my teaching experience is limited to the three months I have spent as a Fulbright English Teaching Assistant (ETA) in Palangkaraya, Indonesia and the year I taught English at the Technical University of Dortmund. However, it appears that some experiences are truly universal, such as the fact that the comparison of teaching experiences usually leads to a vast range of reactions from exhilaration to depression. Some of my fellow English teachers cannot stop praising the high-caliber students in their classes and the uplifting class sessions, while others bemoan that their students cannot, and often appear to not want to, understand a word they say. This should sound familiar to teachers of all disciplines across the globe. 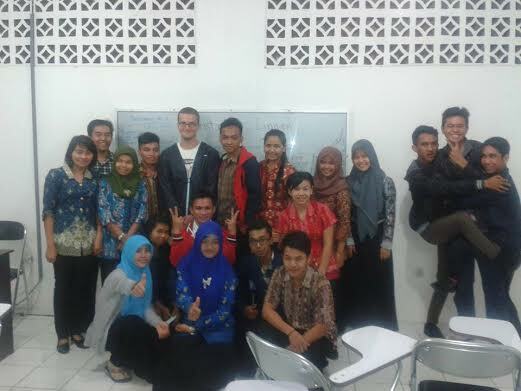 Of course, when it comes to teaching English in a developing country, such as Indonesia, teachers – including ETAs—often feel the urgent need of doing the best possible job to help their students advance their language skills, so that they can become part of the global economy and help their own country advance economically in turn. English is still the international lingua franca, and mastering the English language is an important asset in today’s globalized world. Like my fellow ETAs, I believe that helping my students to improve their English is imperative, and I do everything in my power to support them. However, it is often a struggle due to obstacles outside of my students’, the school’s, or my own control. My time in Indonesia has taught me numerous invaluable lessons about teaching English in Indonesia, problems acquiring decent English skills here, and potential remedies. These difficulties include how students are sorted into various classes, the reduction of English language instruction time in the 2013 Curriculum, the use of poorly-written textbooks, and the less than optimum amount of English being spoken in the classroom. In this article I will present some of the problems and offer potential solutions. I teach at SMAN 2 in Palangkaraya, Indonesia, which is a prestigious public high school. Typically, public schools in Indonesia are regarded as much better than private schools and SMAN 2 is one of the best schools in my area. Thus, my average student’s English language abilities, as well as general academic skills, are fairly advanced. At SMAN 2, like most Indonesian high schools, students are either science, social studies, or language majors. They are sorted into classes with students on the same track and grade. For example, the thirty students in the twelfth grade Science Class-1 in SMAN 2 will take almost all subjects together, physics, calculus, English, etc. ; regardless of how advanced their language, math, and science skills are. This makes for some awkward English classes, which tend to be dominated by a few advanced English speakers. For example, in one of my most talented tenth grade classes, I had them read an excerpt from a Rolling Stone article about the Boston Marathon bombing, which focused on the youngest bomber, Dzhokhar Tsarnaev. [ii] Some of them absolutely loved it and were enthralled by it, but a significant portion were obviously overwhelmed and complained after class that this task was too difficult. My reasoning for selecting it was that it was interesting, thoughtful, and well-written. I expected my students to not recognize certain words, phrases, etc., but I assumed they would be able to understand it. However, I quickly discovered that while this was true for some students, others were simply not able to engage with the text. This situation is not unique as I have struggled with how to teach students that have such drastically different English skills. While I am not trying to suggest that Indonesia needs to completely revamp its educational system, I do believe that the students’ English abilities could be improved by offering different language levels, e.g. low, medium, and high. This would give the students with less language knowledge a chance to grow without being discouraged. I floated this suggestion to a fellow teacher at my school, who quickly shot it down with the argument that we would be harmful to the students’ feeling. This is a common argument not just in Indonesia, but also in the United States where many American parents and teachers are averse to sorting their students based upon their academic skills and achievements. We are often told that this is insensitive to students, but I think it is extremely naïve to assume that students do not realize which of their peers are good at school, just like children realize which of their friends are good at sports, funny, etc. Typically, science-track students tend to have the best English in my experience,[iii] but there is still a high degree of variance, and many non-science students possess excellent English skills at SMAN 2. If the students took English classes based on their skill levels instead of their chosen field of study, the teachers could better cater to the needs of their various classes. There is no need to bore advanced students with simplistic work, just as there is no point in giving less-skilled students difficult tasks they cannot comprehend. Since the current system of separating students comes directly from the federal government, the initiative to change it has to come from Jakarta instead of provincial educational administrators and instructors. As an English language teacher in Indonesia and a strong believer in the usefulness of learning English for young Indonesians, it was disappointing to learn that the last curriculum cut the amount of weekly lessons in half. To help the students succeed in learning English, it might be worth to consider a compromise, such as teaching morality in English classes. This way, teachers could teach morality and students would have more opportunity to learn more English. However, ultimately Indonesian parents and educators need to make some tough decisions, as the battles for more class time in specific subjects are often zero-sum games. If the Indonesian federal government decides to keep the reduced amount of class time for English, then it is vital that it does everything to make sure students are getting the most out of it. Language instruction in Indonesian high schools is often hindered by the quality of materials used in class, which teach and reinforce poor English. For example, a fellow American, who also works at a very reputable high school in Kalimantan, once showed me a page from a workbook they had to review with their students. The worksheet was about a cat named Pus-pus and is included below. Besides the bad English this story uses, the same worksheet asked the student questions that it did not provide answers for, such as Pus-pus’s gender. Most of the other high school workbooks I have seen appear to be written by non-native speakers and they may, for the most part, avoid some of the glaring problems presented by the story of Pus-pus, but they often fall far short of expectations as they contain grammatical errors, awkward phrasing, and poor English. It is understandable that Indonesian secondary schools’ English language instructors do not all speak perfect English, but it is disconcerting that the federal government has established a uniform 2013 Curriculum for teaching English, but is unwilling to sponsor well-written textbooks. Frankly, you could hire any native English speaker with decent editing skills and it would make for a vast improvement. Obviously students cannot learn to speak or write English well, if their workbooks are full of grammar mistakes and written poorly. Hiring decent textbook authors and editors is not prohibitively expensive and would be of great utility to the students. Provincial leaders and individual schools are unlikely to have the resources to solve this problem, thus, the federal government should follow the new Curriculum 2013 with the basic resources necessary for their students to succeed. The aforementioned problems are symptoms of deeper problems in the Indonesian educational system. Indonesia has an educational system that the Organisation for Economic Co-operation and Development (OECD) ranked 64th out of 65 countries surveyed for fifteen year-olds’ achievements in math, science, and English. [ix] For a better perspective, one can compare this number to its neighbors, such as Vietnam, which ranks 17th and Malaysian, which ranks 52nd. [x] Despite all of the aforementioned problems, I am one hundred percent confident in our students’ abilities to succeed. At my own school, I am constantly amazed by the cleverness and aptitude of my students. Two of my best students won the provincial science fair with a brilliant project on a chemical compound they created to help wounds heal faster. This, despite the fact they both come from disadvantaged backgrounds and lack the resources of many of their more well-to-do classmates, let alone the average Western high school student. I see the intelligence, drive, and dedication of my students every day, so I know they are brilliant and hardworking. These students are being disadvantaged, as they are more than capable of competing with and besting their peers in Southeast Asia and the rest of the world, but are unable to due to a lack of resources. My host school SMAN 2, again widely considered the best in my city, offers some potential solutions, although much of the initiative for reform must come from Jakarta. Indonesian high schools are given several elective hours, which they can use for whatever subject they want. SMAN 2 uses some of its elective hours to increase the amount of English instruction for students. As I mentioned previously, the English language teachers go out of their way to use mostly English in the classroom. The textbooks are also imperfect, but much better than Pus-pus’s story. The school does a great job with the resources it is given. Unfortunately, it often faces obstacles out of its control, and there are many other schools in Kalimantan and Indonesia in general that do not do as good of a job of teaching their students English. All of the aforementioned problems are very fixable and correcting them would go a long way in improving English language instruction in Indonesian high school classrooms. The solutions are not controversial. Many of these difficulties appear to stem from an overbearing and inefficient federal bureaucracy, which the newly-elected President Jokowi has promised to improve, although only time will tell if he will be successful. Meanwhile, it is a struggle for English language teachers, both Indonesian and foreign, to help their students achieve the necessary English competency to succeed. Hopefully, 2015 will bring new solutions and innovations to English language instruction in Indonesia to allow our students to thrive. [i] This article is a rough draft of a presentation that the author will give at a conference at the University of Palangkaraya on January 18, 2015 about teaching English in Indonesian High schools. [ii] Janet Reitman, “Jahar’s World,” Rolling Stone 17 July 2013, http://www.rollingstone.com/culture/news/jahars-world-20130717, accessed 29 November 2014. [iii] In Indonesia science students are typically considered the most gifted. For example, many of my fellow teachers assume, to be fair often correctly, that their science classes have the best English. In my own experience there are plenty of students in non-science classes, who speak excellent English and others who do not, but the average student in a science class has better English skills than the average one in a non-science class in Indonesia. So, the idea of a system based on being sorted by your English skill-level being insensitive is fairly ironic. [v] At SMAN 2 each hour of classroom time is actually forty-five minutes of instruction. So, if your English class is two hours, you will teach for ninety minutes. [vi] Sara Schonhardt, “Indonesia Envisions More Religion in Schools,” New York Times 6 January 2013, http://www.nytimes.com/2013/01/07/world/asia/in-indonesia-science-may-give-way-to-religion.html?pagewanted=all&_r=2&, accessed 7 December 2013. [vii] CV. Cahaya Pustaka, Bahasa Inggris: Kelompok Mata Pelajaran Wajib (Sukoharjo: CV. Cahaya Pustaka, 2013), 23. [viii] Hayo Reinders, “Personal Learning Environments for Supporting Out-of-Class Language Learning,” English Teaching Forum 52 (2014), 4: 14. [ix] Elizabeth Kennedy, “A Look at the 2013 Curriculum,” Indonesiaful 16 January 2014, https://indonesiaful.com/2014/01/16/2013-curriculum-indonesia/, accessed 29 November 2014. About the author: Chris Linnan is a Fulbright English Teaching Assistant in Palangkaraya, Central Kalimantan. He graduated from Emory University in May 2014.